This EOD Range Bag is made by Warrior Assault Systems. The EOD Rage Bag is the Warrior Low Profile Grab Bag and was designed with input from operators in the field. This bag allows you to carry all your essentials in your vehicle or over your shoulder. Large zips give you access to the bags main compartment which includes two dividers with a pocket for the MBT Radio, straps for chem lights, 3 x elasticated straps on the inside back wall to hold extra mags, torch, gloves etc. and a hook & loop compartment that includes pistol and magazine holster. There is also additional space for medical supplies, food, water bottle, etc. The exterior of the bag has a GPS pouch, two pistol mag pouches and 3 x 5.56mm Open Mag Pouches with Bungee Retention for a faster reload, (holds a total of 3 x 5.56mm mags). What makes this bag even better is a removable padded shoulder strap and the large over flap, which includes a map pouch, that covers the main zip compartment and M4 pouches and secures with a Fastex buckle ( the flap cover can be folded back and secured when not required ). It disguises the contents, making the E & E Bag ideal for low profile operations, as a vehicle bag or simply an operational bag for carrying lots of kit. 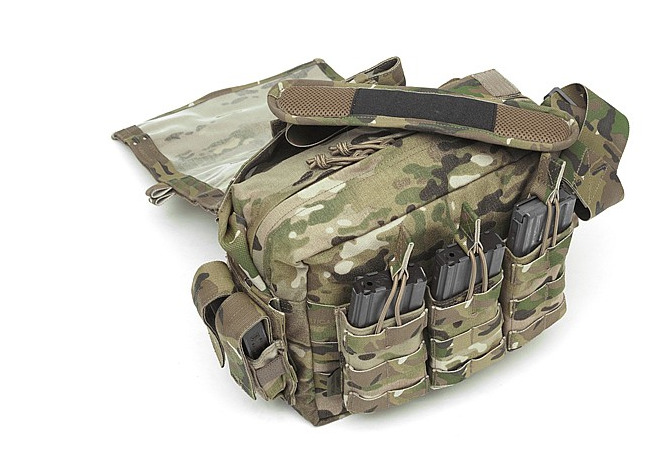 A new recent addition is a single Molle Pouch added to the chest section of the shoulder strap which can hold a single pistol mag or a small torch.